We stopped at the craft store this morning to grab some water beads. We managed to find the ones that were not already enlarged so A could watch that process. 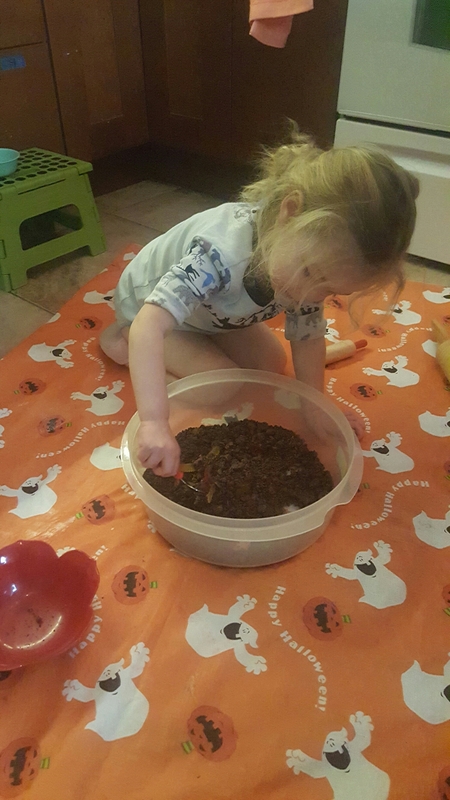 It was nice that it took only about 4 hours because we were able to start it before lunch and then by the time she was up from nap and snack they were ready to be played with. 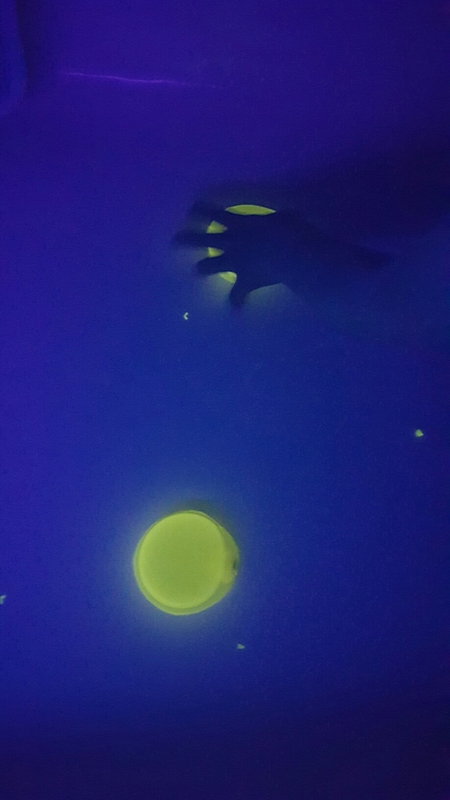 Yesterday I made some Glow in the dark gelatin with the instructions from “150+ Screen-Free Activities for Kids: The Very Best and Easiest Playtime Activities”. 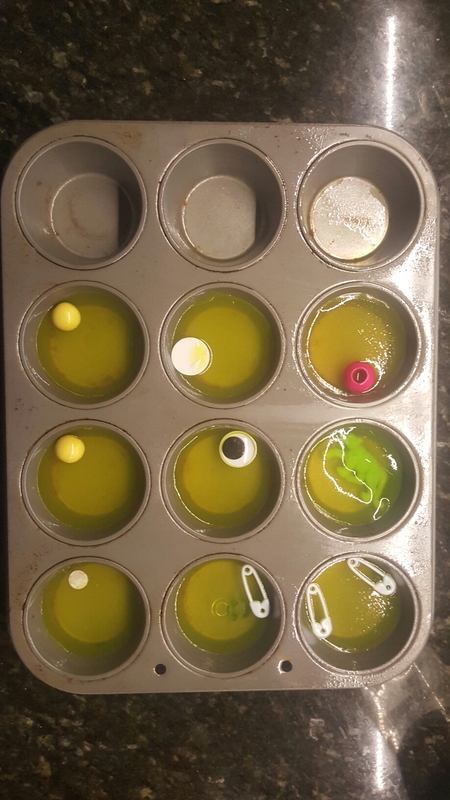 I decided to put it in a muffin tin and add random objects to each one. 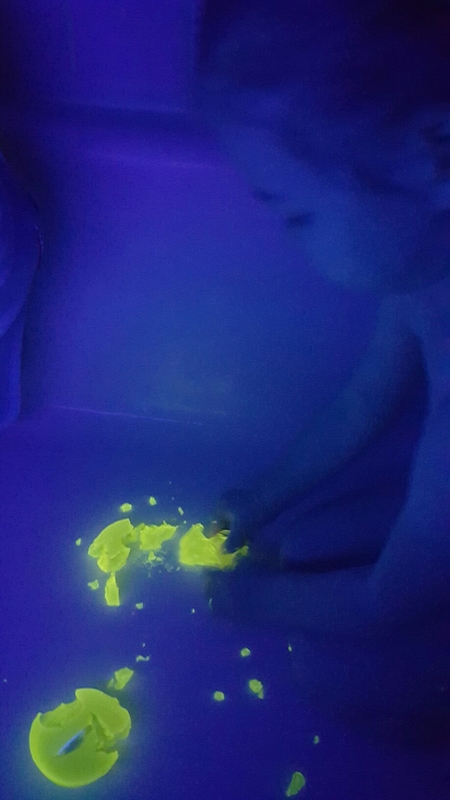 A was very excited to try this out, so after breakfast we headed to the bath tub with the gelatin & a black light(as I was unsure how messy this would be). She had a blast playing with it, finding the objects, squeezing it into small parts, ect. 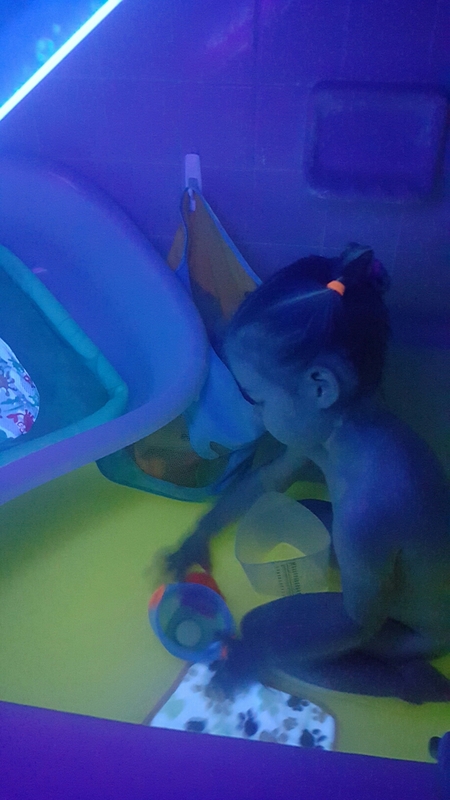 Then when she was done with that, we scooped up the bigger pieces & then added water to the tub to play in glowing water. (We added 1 more crushed vitamins to make it glow better). She was even excited that the water was light yellow without the black licht. I would call this a success. I remember when A was excited to play with sticks, but did not want to touch messy things with her hands or feet. So we have been working on sensory play. Today it continued with Miniature Water Beads. Like this: http://www.funathomewithkids.com/2013/10/safe-edible-non-chokable-mini-water.html She had a blast. We made: red, green, & blue. But then when we mixed them together the red was too much and they all turned purple. But she had a blast playing with them. We started by crushing Oreo’s in a large bag in whatever manner A could be successful (pounding with hands, rolling pin, stomping). Then we poured them into a large bowl & added a few gummy worms. And then we went to town! I have found A to be more receptive to instruction if she has a few initial minutes of unstructured play. Then I join in and then suggest things to try or questions to answer. Some of our activities: Bury & then find the worms. Sort the worms by color. Count the worms. Use spoons & transfer “dirt” between 2 containers. Like in all of my potential messy activities I lay a table cloth down on the floor first to help with clean up. SKILLS: Gross motor (crushing). Fine motor (spooning dirt). Hand eye coordination. Problem solving (how crush, how find worms). Color recognition. Matching. We have been enjoying the colored rice I made. We have done an art project and we use it as a sensory object. There are many days A asks to play with the rice. She can spend a long time stirring, pouring, and all around just playing in it. 🙂 Fun, easy, & a cheap activity.